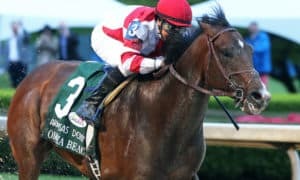 A field of 11 are set to do battle in Saturday’s Grade 1 Breeders’ Cup Longines Distaff at Churchill Downs. This year, the race will be contested on Saturday, instead of it’s normal spot as the feature race on Friday. It is scheduled for race 9 on this star-studded card, with a local post time of 4:16 PM ET. 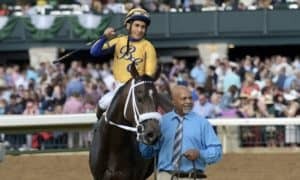 There are plenty of question marks surrounding this field, which could make this event one of the more challenging Breeders’ Cup races to predict. The biggest mystery surrounds Abel Tasman, who looked to be a heavy favorite for this race, before losing badly in her last start at Santa Anita in the Grade 1 Zenyatta Stakes. That non-effort flipped this division upside down, while giving several horses a shot. However, Abel Tasman has been working out well since that race, which could mean the Zenyatta Stakes just wasn’t her day. Mike Smith will have the mount, with her breaking from post 2. Kentucky Oaks winner Monomoy Girl has been installed as the 2-1 morning line favorite. That favoritism is deserved, with her crossing the line first in every start she has made this season. She has amassed 4 Grade 1 victories this year, while being disqualified from a 5th last time out in the Grade 1 Cotillion Stakes at Parx. Monomoy Girl drew all the way to the outside in post 11, which is exactly what happen in the Kentucky Oaks. Once again, Florent Geroux will have the mount. One horse that can no long be taken for granted is Blue Prize, who loves Churchill Downs. She comes into this spot with three straight victories, including the Grade 1 Spinster Stakes at Keeneland in her last start. This is the most under-appreciated horse in training, who could shed that label with a victory in this contest. Blue Prize had drawn post 10, with Joe Bravo aboard. 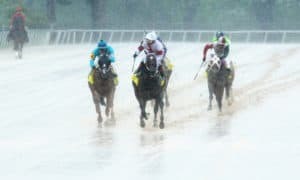 The full field from the rail out includes: Champagne Problems, Abel Tasman, La Force, Mopotism, Wonder Gadot, Verve’s Tale, Midnight Bisou, Vale Dori, Wow Cat, Blue Prize, and Monomoy Girl. #2 Abel Tasman – There is no doubt she is a risk in this spot. Her 5th place effort in the Grade 1 Zenyatta Stakes was terrible. However, if she can bounce back from that poor effort, there is no doubt she is the best horse in the race. After her Grade 1 Personal Ensign score this horse was a lock to win this race. One poor effort won’t scare me away, especially since she has been working out well since that loss. Best of all, if we can get her at the morning line price of 7/2, then she is a must bet. 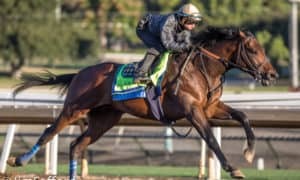 7/2 on the most talented horse in the race would be a gift. #11 Monomoy Girl – This 3-year-old has had an absolutely brilliant season, winning 4 Grade 1 races at 4 different tracks. 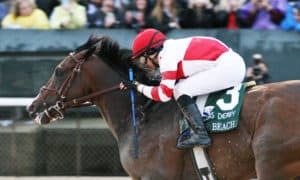 She draws to the outside in this race, which is concerning, but don’t forget she did the same thing in the Kentucky Oaks and it didn’t bother her. The pace dynamics could work to her favor. There is not a lot of speed signed on, which means if she breaks well she should not be too wide going into the first turn. There is no doubt she has to be respected in this spot. Her low morning line price of 2-1 is the only reason she may not be the best bet as just a straight win. 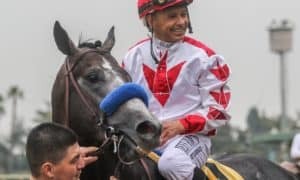 #9 Wow Cat – She made her United States racing debut three races back for trainer Chad Brown, where she finished second in the Grade 3 Shuvee Stakes at Saratoga. 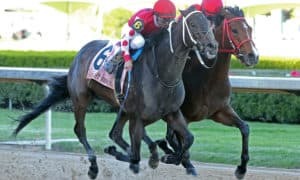 That race was followed by a distant third place effort in the Grade 1 Personal Ensign, before showing improvement in a win at Belmont Park in the Grade 1 Beldame Stakes. There is no doubt she is getting better with each start in this country. If Abel Tasman fails to show up with her best effort this horse becomes a logical contender. #10 Blue Prize – Quietly, this mare has put herself in a position to where she could be the top older female in the country with a win in this race. She comes into this contest with a 3-race winning streaking, including a Grade 1 triumph last time out in the Spinster Stakes at Keeneland. At Churchill Downs she has never finished worse than second in 5 career starts. This will be the toughest field she has faced all year, though, which means she still has a little more proving to do. 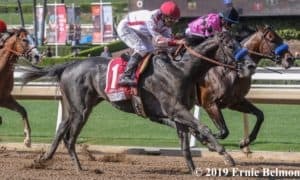 #8 Vale Dori – Finally, this filly got back to her winning form last time out in the Grade 1 Zenyatta Stakes at Santa Anita Park. It had been over a year since her last victory after she had fallen off form in a big way this season. If Baffert has her back to her top caliber races, which he very well may, then this filly can make some noise in this spot. #7 Midnight Bisou – If the race was just a bit shorter there is no doubt she would be a major contender. At races going a 1 1/8 miles or longer she has been a bit flat down the lane, which is why she has landed in the “exotic plays” spot. At this distance she may not be able to beat this caliber of field. However, you can’t count her out, as she has plenty of talent and class. 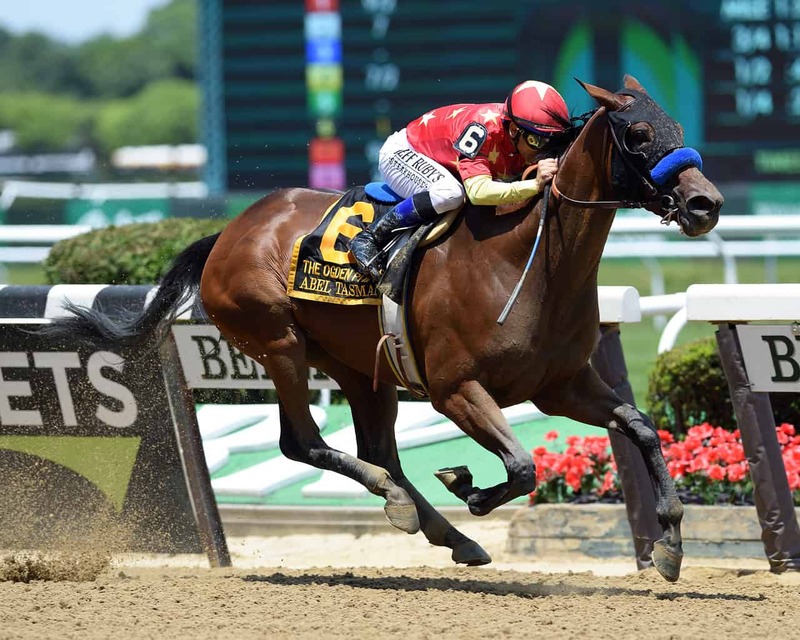 #1 Champagne Problems – This daughter of Ghostzapper has been steadily improving all season long. 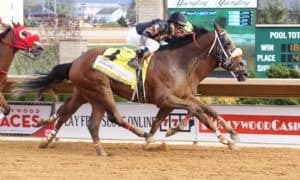 Three races back she picked up her first graded stakes victory in the Grade 3 Groupie Doll Stakes at Ellis park, before finishing second to Blue Prize in close losses in her last two starts. Hitting board seems to be logical one again today, while we know she also loves running in the state of Kentucky. #3 La Force – She has finished second in three straight races, losing to Unique Bella twice and Vale Dori. There is nothing to be ashamed about when losing to those types of horses, while each time she was within range approaching the wire. That should bode well for her in this race. This is the deepest field she has faced all season, though, so there is no doubt she will need a big effort. 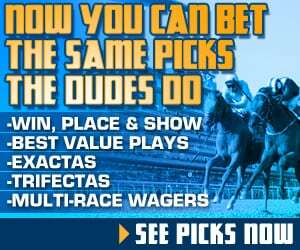 Get full race previews and wagering strategies for all 14 Breeders’ Cup races in our exclusive Inside Track to the Breeders’ Cup Wagering Guide HERE. #5 Wonder Gadot – There is no doubt she has fallen off form lately. However, maybe a return to Churchill Downs will be what she needs. The last time she was here she nearly won the Grade 1 Kentucky Oaks, losing by less than a length to Monomoy Girl. The pace set up could be to her favor today if she does indeed rebound with a big race. #4 Mopotism – This filly has made starts against some of the best in the division throughout her career. However, she seems to be a cut below the elite horses, while also starting today off of a 4-month layoff. #6 Verve’s Tale – She just looks to be overmatched in a race of this caliber. The last time she won a race was August 2o, 2017, which came in a small stakes at Saratoga. 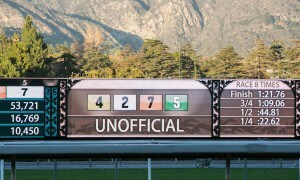 Want to know how we are betting this race? Download our 38-page Inside Track to the Breeders’ Cup Wagering Guide to get all our betting strategies and advice for all 14 Breeders’ Cup races.